As a closet Jaqueline Wilson fan (although posting such a detail in a blog removes me from the closet somewhat, I suppose) this week was somewhat of an indulgent treat at the Children's Literature Centre with Wednesday welcoming the lady herself to present the award given in her name to the Masters student who achieved the highest mark on their final thesis. This was followed up by the last of this term's PhD seminar series on Thursday where we all got together to share and discuss our critical readings of her latest novel, Four Children and It. As a sequel to one of my favourite classic texts, the book has brought a modern breath of fresh air to the tale of the Psammead, the grumpy yet amiable sand fairy who Nesbit breathed life into in the original. 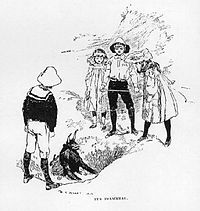 Our discussion, as is often the case, incorporated a variety of different theoretical approaches and readings to the text, although it left one large question unanswered (which would have been inappropriate in the setting, but fun to consider nevertheless): if you met the Psammead, what would you wish for? With my blog post coming at the start of advent and the Christmas season, I have therefore taken the liberty to consider what would probably be a pressing question in the minds of the children that may find the book amongst their presents in a few weeks time. The Psammead's wishes work best for and in the minds of children I feel, a small fact that I have only just considered since attempting to work out what I would wish for given the opportunity. For a child, there is generally (and thankfully) not the life experience that comes with more advanced age - I can think of many people who I would wish to have just one more day with, but the knowledge that they would be gone again at sundown would make that parting even the more sorrowful and the pain of their loss probably greater. There is also a sensibilty that comes with age, I fear, as the desire to fly with wings in the same manner as both sets of children do is metered by a concern for my own safety. Having a tremendous fear of heights doesn't help either! But such ponderings turn the magic of the Psammead sour however and fail to live up to the spirit of the book, so if I were to dispense with such matters what would I wish for? My first wish would probably be to spend a day at Hogwarts with the ability to use magic. It isn't a particularly mature wish, but it would be a lot of fun! Imagine how it would feel riding a broomstick on the quidditch pitch, petting the plants in herbology or watching the colours change on the ceiling of the hall. My second trip to the sandpit to see the Psammead would probably see me wishing to spend a day in one of my favourite cities - probably taking the ski-lift to the top of Grouse Mountain in Vancouver and looking out over the city and sea below me. Such a wish would be no fun without my family beside my however, so the wish would have to include having my husband and children by my side. In keeping with the traditional (pantomime) theme of the season I would probably limit my wishes to three - and as the Psammead is now of a very advancing age he would probably appreciate such a sentiment. So what would my final wish be? This is a simple one: that I might help my children believe in the magic of books (and yes, I know how sickly that sounds!). Even with the wishes ending at sunset, this wish would still be a worthwhile one to make as the memory of it would last. For the cold-hearted cynics amongst the readers of this blog, I apologise, but I have to admit that this is a wish that I have already made and has already begun to be granted; and at last Wednesday evening's award celebration, a few others were able to catch a small glimpse of it at work. This was the moment when my little girl, only at the independent beginnings of reading and writing, opened a copy of Four Children and It which Jacqueline Wilson had signed for her personally some moments before. She looked at her name freshly written, turned to the picture of Jacqueline on the dust cover and smiled again at the "lady with all the rings" who had seemed so pleased to talk to her. She then removed the dust cover (they have never been her favourite part of a publication, book designers take note) and asked me to read her the book. One day she will be able to read the book by herself and will always start her reading with a glance at the first page and remember that moment. And she may wish herself that she might meet the other authors behind the books that she loves, or she may wish to be the writer of one herself. Either way my wish would have lasted well beyond sunset and would have definitely been one worth making.